The beetles diversity is incredibly extensive. There are estimates of around 100 million different species of beetles on earth, of which 300,000 have been classified. They vary in many different shapes, sizes and colors. They can range in size from one millimeter to as large as 200 millimeters. 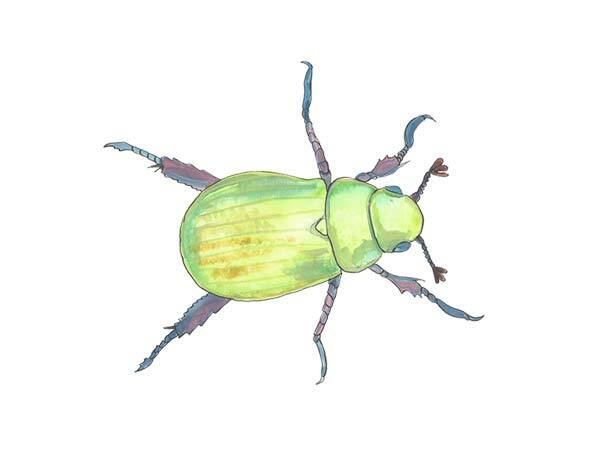 Beetles have three segments to their bodies; head, thorax, abdomen. They have a hard exoskeleton resembling armored plates, which are used for protection. Beetles have a pair of mandibles as mouthparts, which resemble small pinchers. Beetles also have six legs and a pair of antennae at the front end of their heads. Beetles have more species than any other animal on earth; in fact they make up almost 25% of all creatures. Beetles are also the most common of insects, they make up 40% of all identified insects on earth. The habitat for the beetle is as diverse as the species. Beetles can be found in all types of environments except oceans and the freezing artic. Beetle larval usually lives inside a food source until they mature. Beetles go through a metamorphism of four stages in their life cycle. Adults lay fertile eggs, the eggs hatch into wingless larval, soon after they morph into pupa and eventually the pupa morphs into the final adult stage. Beetles will pair up for a brief time while mating and can exhibit bizarre mating rituals. The feeding habits for beetles can vary with the particular species. Ground beetles such as ladybugs are predators and can consume crop-destroying insects such as caterpillars, aphids and scale. Dung beetles play a huge role in the ecosystem by consuming and breaking down manure. However, many other types of beetles and their larva destroy crops and can cause huge amounts of economic loss. The Japanese beetle feeds on over 275 different plants especially those found at vegetable and fruit farms. Powder post beetles and deathwatch beetles infest hard wood and can cause damage to furniture or residential homes. Vacuum the floors and eliminate lint, hair and other debris. Disinfect the floor with hot water and soap. De-clutter the home and keep organic material such as clothing and paper off the floor. Apply an insecticide labeled for beetles, avoiding applying in areas where humans come into contact. Spot treat infected areas such as baseboards, beneath rugs, under furniture and walls of closets. Beetle traps are a fantastic chemical free option for eradicating beetles. Most beetle traps contain pheromones, which attract the beetles to sticky glue boards. Make sure to carefully place the traps in areas where children or wildlife cannot make contact. Having an issue with beetles in your home? We are the local experts in beetle control and prevention. Call us today for a free quote. We can solve your beetle problems today. We service Sarasota beetle control, Siesta Key beetle control, Longboat Key beetle control and surrounding neighborhoods.